Do you need a way to stay in contact with your audience? Email marketing is a powerful tool that allows you to constantly add value to your clients and future clients. Developing well branded email campaigns allows you to begin the journey of developing a lasting, trusting relationship that builds loyal, repeat customers. 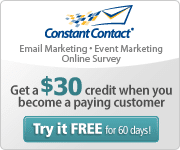 Constant Contact provides email campaign services that allow you to create custom, branded emails for general updates, enrollments, and sale offerings. When you enroll using this link, you receive a $30 credit for your set up fees. We believe in email marketing so much that we offer all of the resources you need to integrate it into your overarching marketing efforts. First, get access to one of the most powerful email marketing tools on the market (and a discount). Then, download the tips for building your distribution list. Finally, enlist the help of experts to help you build schedules and content for actually communicating with your audience. Now that you have a email marketing tool, who are you emailing? How do you build your distribution list? Are you curious about growing your email list but the actual activities needed to get started seem somewhat illusive and daunting? Where do you actually start? These questions are natural. The steps needed are not always intuitive. Here is the most comprehensive list building program I’ve found. It will get you started on developing strategies for growing your email list. This program is an incredible find at an incredibly low price. Get ready to build a plan to find and engage an audience through email marketing. You learn how to integrate list building activities into the things you’re already doing. Furthermore, you will learn additional methods to integrate into your overall marketing strategy.